Asparagus care is not complicated but is well worth the effort. 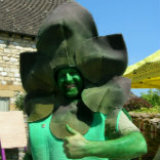 If in your asparagus gardening you deal with the issues of correct harvesting , fertilising, wind protection, insect infestation , cutting back, berrie picking and you make sure your asparagus weed control is good you will have no problems maintaining your asparagus bed in great condition to deliver you some delicious asparagus spears year after year. You should also ensure that you keep the slugs under control. We have already talked at length about how to harvest asparagus and how to control insect infestations and slugs on the pages that follow from these links so here we will concentrate on the other issues listed above. You should have fertilized your bed just before you planted your asparagus. You need to follow this up each year to keep the bed in good condition, however you are not going to be able to dig the bed over. 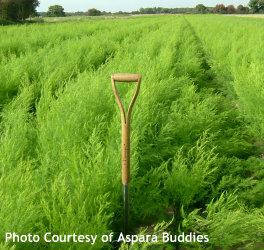 In February / March each year apply a dressing of fertilizer (about 100g/sqm (3oz/sq yard) of Growmore or fish, bllod and bone should do the job) and then in October each year after you have cleared away the asparagus ferns apply a top dressing of well rotted manure or garden compost, about one bucket full per meter run of bed. I repeat do not dig this in. You will damage the apsragus roots that run quite close to the surface. A final bit of asparagus care might involve very gently raking in the fertilizer. After you have made your final cut of the year you are going to leave the asparagus to grow on. It will grow into a plant up to 1m in height with fairly wispy fern like foliage. These asparagus ferns catch the wind. In order to prevent the plants from rocking about too much and / or falling over, which will loosen the roots, you need to provide some protection. Put some stakes in the ground at either end of the rows and / or part way down the rows and put string across between the stakes to stop the ferns from rocking about. Depending on what variety of plant or seed you have chosen you will either have all male plants or a mix of male and female asparagus plants. Only the female plants produce berries and this uses up some of their energy and as a result they have a lower yield of spears by as much as 1/2 or 1/3rd compared to their male equivalents. In order to prevent seedlings taking and growing you need to remove the berries before they ripen. Any seedlings that take should be weeded out as they are not the carefully selected plants and seeds that you have grown and will dilute the quality of your bed. If you have followed all the advice on asparagus care you will have asparagus ferns turning yellow by the autumn (October time). You should cut these back to about 5cm (3") above the ground and remove the tops. Do not leave the foliage to rot on the beds as this will encourage insect infestations. Remove the tops and either compost them or burn them. Asparagus Care must include Weed Control! My final piece of advice on asparagus care is weed control, the bain of my life! I'm afraid i hate weeding, but that is just what you are going to have to do. You really don't want to be hoeing unless very very shallow and light as the asparagus roots are quite close to the surface and easily damaged. The best bet is to have done the preparation to remove weeds in advance of planting your bed really really well and then keep on top of the weeds as they come up when they are too young to have developed a good root system. I have seen it suggested that at the end of the autumn after you have cleared the tops away and fertilized you put down an opaque weed mat to prevent any seed germinating between late autumn and spring. Personally I can't see much point in this. Not many weeds grow in this period and you provide a lovely shelter for the asparagus beetle to overwinter. So you might avoid a bit of weeding only to have more beetles to contend with! If you feel you need to use a weedkiller then you are going to have to be very careful. 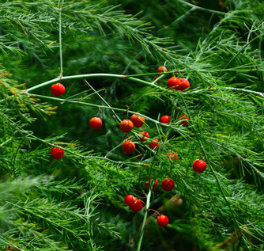 Use a glycophosphate based product and apply it carefully to the leaves of the weeds avoiding the asparagus. Read the instructions carefully especially as concerns the use on vegetable crops.